Is Tim Daly playing Superman again? Discussion in 'Misc. TV Series' started by TheVileOne, Apr 15, 2006. 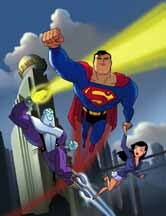 Just wondering, I heard a while back that Tim Daly would once again be voicing Superman on JLU. Watching the episode tonight, it did sound like the Daly Superman of old. I never cared for Newbern's Superman. It always seemed inferior to Daly's. So good going if they brought back Daly. There was a JLU episode on tonight? George Newbern is still doing Superman in "Far from Home"
I see no reason not to use him on JLU. I want to see this, when is it out? Oh, found it, June 20th. It sure is. I can't wait to see it. Geeze its 2 steps forward 5 steps backward on the board. The season has since finished and there was no change in voice actor. Tim is just doing the voice for the movie. Is that picture from the DVD cover? ?